The Rangemaster is an accurate, Extreme BC, monolithic bullet designed to perform on par with the current generation of long range lead-core bullets. This bullet is a combination of excellent BC without sacrificing accuracy. There are plenty high BC monolithic bullets on offer in the world market with exaggerated claims but most of these are not accurate due to dynamic instabilities suffered from chasing too much after exotic BC values. It is a next generation, high accuracy bullet with flatter trajectories and consistent performance and accuracy. This is predominantly a single shot bullet designed for custom rifles with capabilities of accurate shooting beyond 2000m. As a result of the BC optimised bearing-surface, BC optimised boat tail and BC optimised nose design, this bullet compete aggressively with current lead core market leaders. The Glider Rangemaster is an accurate, Extreme BC, monolithic bullet designed to perform on par with the current generation of long range lead-core bullets. 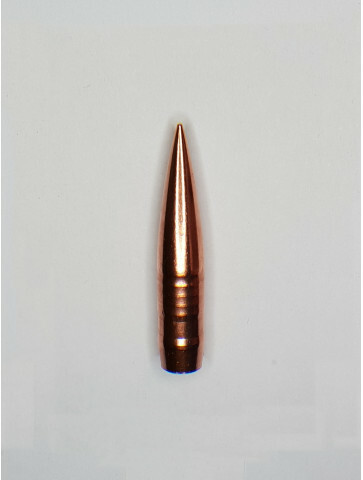 This bullet is a combination of excellent BC without sacrificing accuracy. There are plenty high BC monolithic bullets on offer in the world market with exaggerated claims but most of these are not accurate due to dynamic instabilities suffered from chasing too much after exotic BC values. It is a next generation, high accuracy bullet with flatter trajectories and consistent performance and accuracy. This is predominantly a single shot bullet designed for custom rifles with capabilities of accurate shooting beyond 2000m.